The practice of mindfulness is not only about awareness; it does not stop at seeing life as it is. It is about reconnecting with the values that fire the cauldron of intention and attention – it is not the situation that creates our difficulties; it is the stance we take to it, [mindfulness] opens us to value (but not be passively accepting of) the circumstance as a means of cultivating a desire and a path to transform ourselves. -Lynette Monteiro. This exercise is at the heart of your mindfulness journey and at the heart of dealing and freeing yourself from difficult emotions. Can you gently allow your difficult emotion to rest in the background but really be present for this moment. Again, each time you feel the difficult emotion creep into the foreground acknowledge it and let it be as you go about your day to day life. 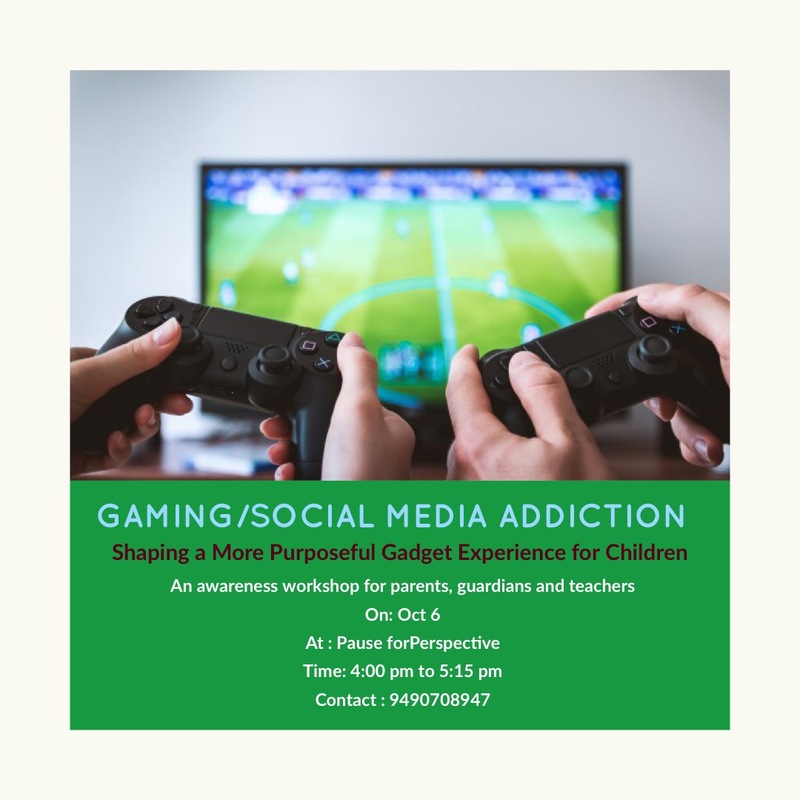 On Oct 6 – Our first ever ‘public awareness workshop’ aims at answering these questions and more. Teachings will include the development of the brain from childhood into adolescence, the stimulatory and regulatory needs of the brain, technology’s impact on a growing brain and the effect on technology’s use on mental health, as well as guidelines about the recommended usage of technology for children and adolescents. 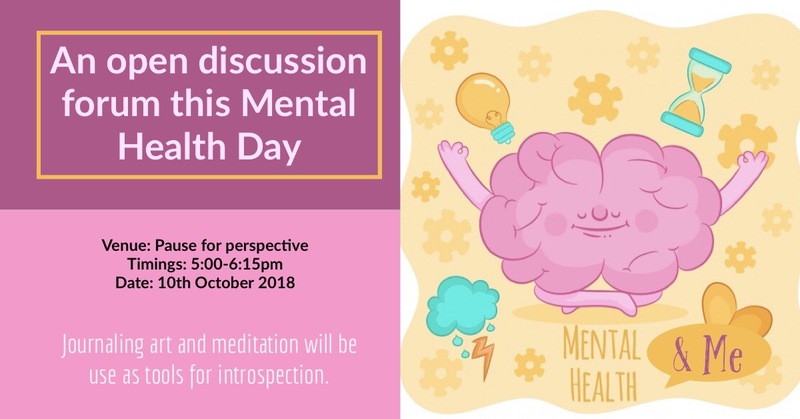 On Oct 10 – An open discussion forum this mental health day.This mental health day let’s look at ways in which we can skillfully BE and care for our thinking, feeling and responding selves. Take time to connect with your deepest intentions for yourself and discuss with us ways to move towards skillful ways of being. 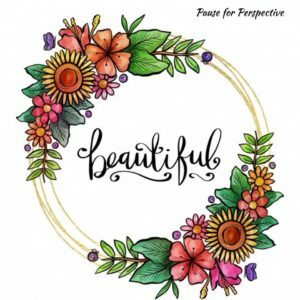 Journaling,meditation and art will be use as tools for introspection. 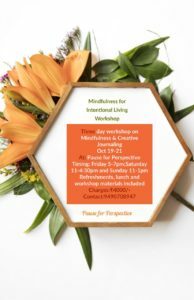 On Oct 19 & 20 – Mindfulness for Intentional Living is the coming together of two different workshops I run-Mindfulness & Creative Journaling. 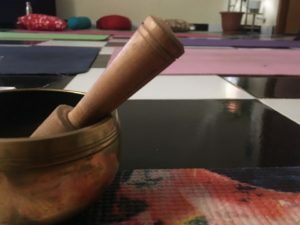 In Mindfulness for Intentional Living we will look at how mindfulness of our inner world and our outer world can help clarify us, make us more creative, intentional and alive in our everyday life. 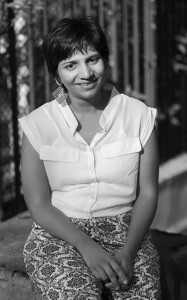 Aarathi Selvan is the Founder and Clinical Psychologist at Pause for Perspective. She is a trained teacher in Mindfulness Based Symptom Management from Ottawa Mindfulness Clinic, Canada and has additional certifications in Family and Couples Counseling, as well as other modalities of psychotherapy and well being. She collaborates with individuals in integrating mindfulness and intentional living to promote skillful, creative and successful lives. Aarathi leads women to deeply explore and embrace their self-hood, she leads workshops on creative journaling and intentional living. She also teaches mindfulness to individuals from all walks of life. In addition to her work at Pause for Perspective, she is a visiting faculty at St. Francis Degree College and an advocate for ethical and mindful practice of counseling and psychotherapy. She also works as a Psychologist at Facebook, Hyderabad.